﻿ Best Price on El Morro Eco Adventure Hotel in Monte Cristi + Reviews! Located on the edge of Monte Cristi National Park, El Morro Eco Adventure Hotel offers an outdoor pool and stylish rooms with garden views. Lo Italiano Beach is 984 feet away. Rooms at the El Morro Eco Adventure Hotel feature minimalist décor, air conditioning and free Wi-Fi. Each room includes flat-screen cable TV, a telephone and a modern private bathroom with a shower. 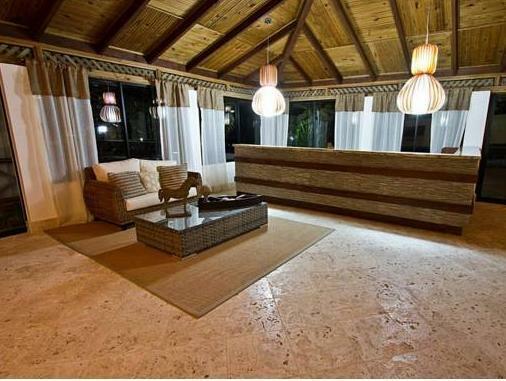 El Morro Eco Adventure Hotel has 2 restaurants and a spacious lounge bar. There is also a tour desk, where you can arrange boat trips and outdoor activities, including kayaking, snorkeling, mountain biking and hiking. Free private parking is available at the hotel. It is just a 5-minute drive to the town of Monte Cristi and Osvaldo Virgil Domestic Airport. Puerto Plata is a 2-hour drive away.